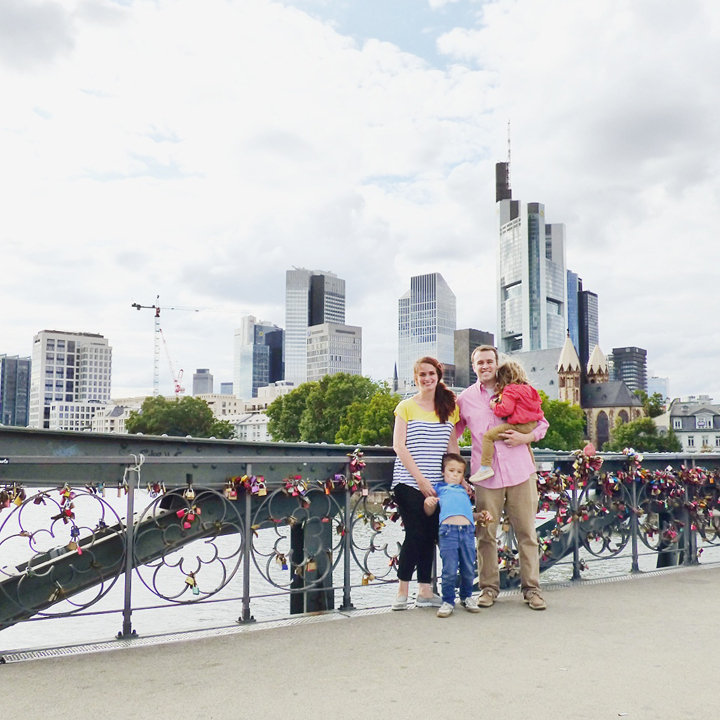 After driving by Frankfurt many-a-time (and I actually went there for dinner with Scrapbook Werkstatt in September 2014 and to work at PaperWorld in January) it was fun to bring the fam and get to know this modern city in depth! Frankfurt offers a good look at today's no-nonsense, modern Germany. It is a business hub of the united Europe and home to the European Central Bank. With its forest of sky-scrapers perched on the banks of the Main (pronounced "mine") River, Frankfurt has been dubbed Germany's "Mainhattan." We found parking and Fox lead the way to the Main Tower. Looking up at the cool skyscrapers. The Main Tower was finished in 2000 and offers the best (and only) viewpoint from the top of a Frankfurt skyscraper. It was a 55-second ear-popping elevator ride to the 54th floor and then a 50-stair hike to the rooftop. Once on top you get views of the city 650 feet above street level. I spy the ginormous Frankfurt train station. Even with all the skyscrapers and offices, a third of Frankfurt is green space. We saw about 50 planes come and go from up there. I flew out of the Frankfurt airport in March when I went to Denver to film two Craftsy classes. The antenna pole on top looks like a candy cane. After enjoying the views on top of the Main Tower we descended and continued on our walk. We passed by the Opera House which was finished in 1880. The original was destroyed in WWII, but unlike most of the city it was rebuilt in the original style. There was a hubbub going on in the square in front of the opera house. The kids really wanted to ride the little boats in the fountain but that was a disaster waiting to happen so we kept moving. We moseyed down Fressgass' which was lined with booths selling delicious food. Crepe stand? Yeah, we stopped and I got my usual Nutella crepe. Then we saw this mega meat-grill (to which we would return to get dinner). We loved the modern vibe of Frankfurt. It reminded us of a downtown city in America. As we walked we saw this awesome Star Wars Lego display. Apparently it was "Force Friday" and Lego released a bunch of new Star Wars-themed sets. We left Fressgass' and headed down the a tree-lined pedestrian drag called Liebfrauenstrasse. There was a beautiful flower market here. Just down the way was St. Paul's Church which is known as the "cradle of German democracy." It was here, during the political upheaval of 1848, that the first freely elected National Assembly met and the first German Constitution was drafted, paving the way for a united Germany in 1871. 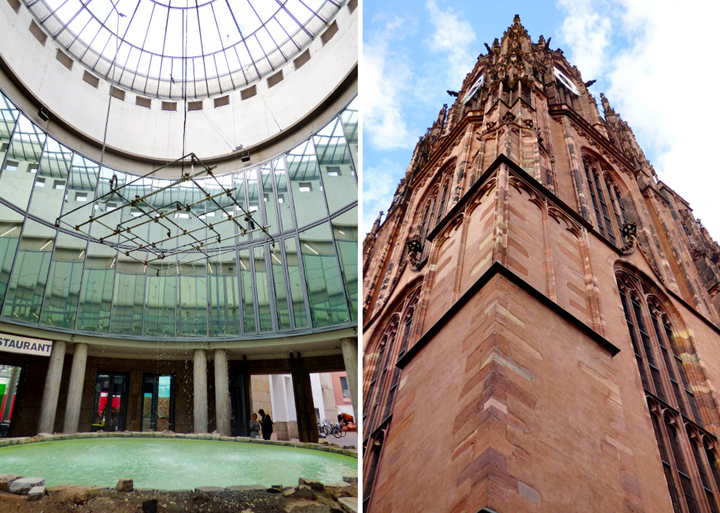 We were now getting into the historic core of Frankfurt which has retained its medieval vibe. A la Bridge of Sighs. 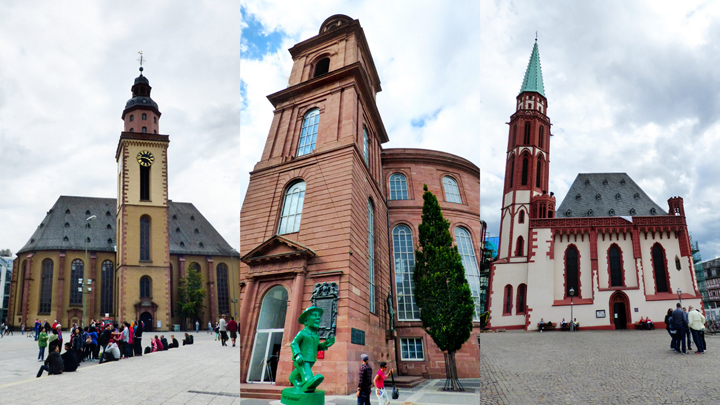 Churches galore in the Römerberg, Frankfurt's market square and the birthplace of the city. The Evans Family in Frankfurt, Germany on Friday September 4th 2015. The Römer, the old Town Hall, of Frankfurt. Today it houses the city council and mayor's office. This cute row of half-timbered houses is typical of Frankfurt's quaint old center before the square was completely destroyed in WWII. We passed through the Schrin Art Center on our way to check out St. Bartholomew's Cathedral. Rebuilt in the 1950s, this Catholic church is made of modern concrete with paint to imitate mortar and medieval bricks. Originally from 1152, this church was destroyed by fire in 1867 and had to be rebuilt. Then, it was seriously damaged in WWII but was repaired and reopened in 1953. Down on the river we crossed the fine old iron Eiserner Steg bridge. It offers great views of Frankfurt's modern skyline. Love the skyscraper skyline! Not many cities that look like this 'round these parts. But, just as you are about to forget you're in Europe, you run into something like this. So cool. We headed back to the Fressgass' to sample various delectables from all the food stands. Delicious! I also want to note that it was at this point that I got a very fun email. Self, you know which one I'm talking about :) Germany, I think, is the best country we've been to for easy, tasty street food. Meat? Good. Bread? Good. We walked back to the underground garage, paid for parking, found our car, drove a few minutes to our Novotel hotel (with a pit stop to fill up at an Esso gas station) and had an easy rest of the night. Early the next morning we packed up and headed to the last stop on this whirlwind trip: historic Heidelberg! Thanks for the virtual tour!! I love Frankfurt...it's been too long since my last visit!